The small lighthouse at the western end of Stångehuvud is the special headmark of the area, visible both from land and sea. It was built in 1890 and is a popular destination for both locals and tourists who want to take a walk in Stångehuvud. By the lighthouse you have a lovely view of the archipelago, whether in calm or stormy weather. Rock formations around the lighthouse are among the most beautiful in the whole Stångehuvud area. During the first decades of existence the lighthouse was operated with kerosene. It is said that boys in Lysekil had to help the lighthouse keeper carry kerosene cans over the hills out to the lighthouse. However, in 1917 the kerosene operation was replaced by acetylene gas lighting. The constant refuelling was no longer needed. The gas tubes were changed from time to time by the Maritime Administration staff from Ärholmen near Marstrand. The former lighthouse in Stångehuvud is, besides a popular excursion goal - summer as winter- sometimes a place for engagements and marriages. The view at the lighthouse is admired a summer day at the former turn of the century. At that time there were no safety fence at the outside of the lighthouse. The lighthouse at Stångehuvud was in operation until 1940. In that year the light was finally extinguished in the small wooden house. 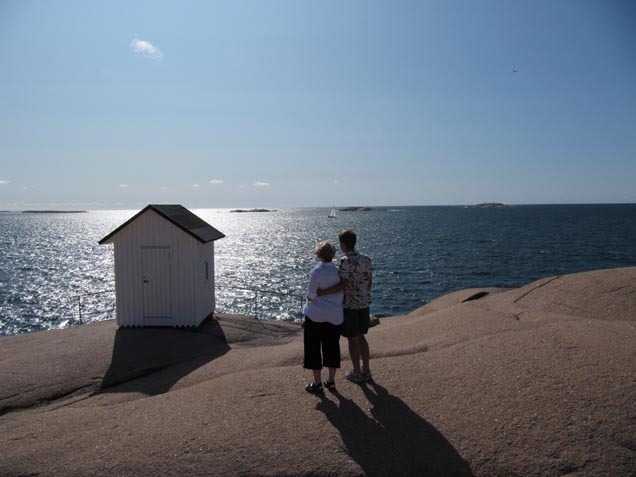 its function superceded by a new lighthouse on the nearby islet of Humlesäcken. 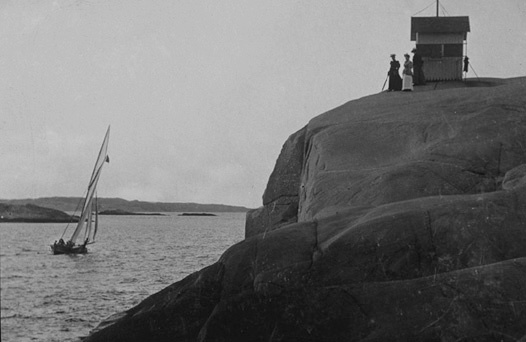 However, the lighthouse had become so strongly associated with Stångehuvud that its demolition was never a question. For many years the Vikarvet Culture Historical Society has had the liability for its care and maintenance. In the summer of 2009, the lighthouse underwent a much-needed renovation. Roofing materials, windows and the door were replaced. In the summer of 2014 the Curman Foundation installed a solar panel on the roof of the lighthouse, feauturing a twilight switch and a battery that powers an LED lamp as "decorative light". The old lighthouse shines once more. In June 2017 the Curman Foundation bought the lighthouse from the Vikarvet Culture Historical Society and at that time the roof and front of the house was renovated.